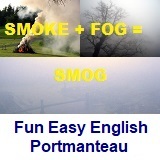 ﻿ Fun Easy English - new american english language vocabulary standard portmanteau merged words definition meaning introduction. Learn the American English standard portmanteau used by Americans in everyday speech and in written materials. The definition overlaps with the grammatical term contraction, but contractions are formed from words that would otherwise appear together in sequence, such as do and not to make don't, whereas a portmanteau word is formed by combining two or more existing words that all relate to a singular concept. A portmanteau also differs from a compound, which does not involve the truncation of parts of the stems of the blended words. For instance, starfish is a compound, not a portmanteau, of star and fish; whereas a hypothetical portmanteau of star and fish might be stish. Hey do you know any English Portmanteau not listed in Fun Easy English?